I was recently in Indianapolis as the Keynote Speaker at the unsecured fixed rate loan First Asian Organization Leadership Retreat at the request of my friend Theresa Kulczak, Executive Director of the Japan America Society. 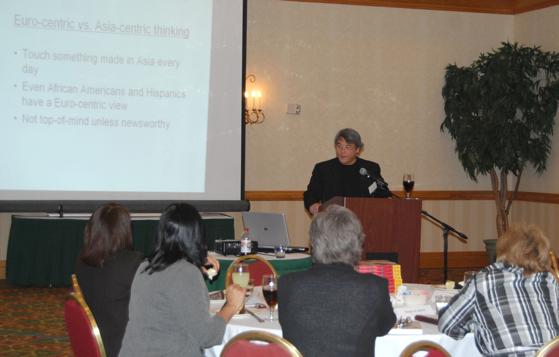 In addition to the dozens of Asian American organization leaders (as the name would suggest) in attendance were out-going Butler University President, Bobby Fong, Indianapolis Mayor Gregory Ballard, President of the International Center of instant decision loans bad credit Indianapolis Diane Thomas, and visionary Albert Chen, Chairman of Telemon and major sponsor of the event. I expected to see the same sort of crowd I’ve witnessed on the West and East Coasts, but to my great surprise, they were quite different. Not that the make-up of the attendees (Chinese-, Japanese-, Indian-, personal loans moline il Filipino-, Vietnamese-American et al) was significantly different, but their attitude certainly was. Given that three of the top five immigrant groups in Indiana are of Asian origin – Chinese, Indian, and Korean – I was surprised to find out that this was the first sort of coming-together of various Asian American payday loan guarantor groups in the city. The first time? In an area with a population of around 2 million? Yes. Asian Americans in Los Angeles, San Francisco, New York and even Chicago tend to forget that APAs have only just begun to spread beyond the traditional ethnic enclaves around the country to areas 78477 cash advance where business, education or culture offer individual and community growth opportunities. What struck me most profoundly was the energy with which the attendees came to the event and enthusiasm for working together for a common cause. They seemed to carry none of the baggage or cynicism I’ve seen among APA groups that have unsecured loan sainsbury had a longer history in cities with larger APA populations. Whether this was from naiveté or a true desire to work together is irrelevant. The outcome of the day was an understanding that partnerships work, whether with the private sector, with the city, or with each other, and each person was committed to moving the greater APA agenda ahead. It looks like Indianapolis is poised to be one of the great APA cities of the 21st century. My thanks to Weilin Long – director of the Asian Learning Center of Indianapolis – and her staff for putting this all together. This is a “must-have” guide to marketers to address Asian Pacific Americans. You will gain useful insights that enable development of relevant strategies and marketing plans to effectively address one of the key target markets in America. Finally, an accessible, practical and intelligent guide to the Asian American population. This book will inspire you to marketing efforts that are much more likely to succeed because it is full of contemporary cultural insight and explains the past without stopping there. For any marketers in the multicultural space, I highly recommend it. In order to write a book, one needs wisdom. Mr. Kumaki has it in spades. Most marketing books are self-promotion fluff. Bob writes from the heart and the head. If you want the real truth about the multiple-faceted Asian American market, you’ve found the wisdom you need. A wonderful source for both advertising /marketing professionals and those looking to teach students about the increasingly diverse US marketplace.